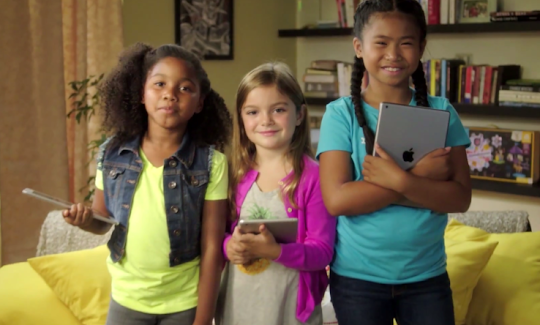 GoldieBlox, the San Francisco Bay Area startup focused on building toys for girls aimed at getting them hooked on engineering, has this morning taken its first steps into the digital realm with the debut of a new iOS application – the company’s first – GoldieBlox and the Movie Machine, as well as a “digital playground” called Bloxtown.com. The new app works as a way to engage with the GoldieBlox brand as a standalone experience, but also ties in with the company’s physical toys, by allowing kids to print out their animations and other creations and then use those cards along with their real-world toys, if they choose. GoldieBlox, for those unfamiliar, has been selling a series of construction sets designed to appeal to girls’ interests – instead of building scary robots, for example, the toys let girls build machines that move and spin and include cute characters like cats and puppies, accompanied by a storybook that guides the action. The startup is probably best known for its marketing campaign which this year included a high-profile Super Bowl ad that parodied the toy industry’s obsession with using the color pink for its “girl” toys and focusing on “fluffier” activities like playing princess in a castle. While I personally don’t think there’s any problem with girls playing make-believe, I agree with GoldieBlox’s overall vision which is that girls deserve a wider variety of toys, including those that encourage making and building and, you know, actually thinkingabout things. The new iOS app supports that same agenda with an app that’s fun, but also educational. The app uses the voice talents of Kari Byron of TV’s “MythBusters,” and and Emily Haines of the rock band Metric, and marks the debut of the company’s first animated short, where Goldie and friends build a zoetrope to save the Bloxtown Film Festival. The app’s educational value comes in as teaches the basics of animation by having kids create 12-frame animated GIFs through additive illustration. Those creations can then be uploaded and (soon) shared on Bloxtown.com, where kids can also explore educational tutorials, view others’ creations, and check out the character Goldie’s world for the first time. As an iOS app, the company also seems to be crossing over into more “unisex” territory, as nothing about the app seems to necessarily discourage boys from also enjoying it. In fact, GoldieBlox even recently added a boy character to the Goldie story named Li Gravity. “At the end of the day, it’s all about leveling the playing field,” says Lewis. His statements mirror some of the new rhetoric around how to best enact changes that can help eliminate the sexism in today’s culture, and specifically in the tech industry. It is not, perhaps, all about having girls who try out engineering concepts through play, but about making sure that when they’re ready to take further steps later in life to actually study engineering or work in the field, the “boys” respect them as peers, not oddities. Of course, the company’s expansion into digital (and to boys), could also hint at GoldieBlox’s need to beef up its revenue in new ways. Though the app is free, it’s designed to complement – and therefore encourage – sales of its physical toys, which now includes six GoldieBlox storybook and toy construction sets, ranging from $19.99-$59.99. The company declines to share its revenue figures, sales, or customer numbers – a reluctance that may speak to the fact that its initial products are moving slower than it would want to brag about, despite the company’s heart-warming mission. A digital playground could give the company more opportunities to experiment with which concepts actually draw in young, would-be engineers – male or female – whether that’s building machines or animating GIFs or something else entirely. The new app is a free download here.